What happens when artistic cultures migrate and meet? How do migrants navigate between tradition and assimilation? The centerpiece of Manthia Diawara's An Opera of the World is a staging of Wasis Diop’s Bintu Were, A Sahel Opera, filmed on location in Bamako, Mail in 2007– a pioneering work telling the story of migration from West Africa to Europe by combining traditional Malian music with the structure of the Western operatic art form. Diawara’s film serves as a mirror to build an aesthetic and reflexive story, through song and dance, about the current and yet timeless drama of migration between North and South, and the ongoing refugee crises. The film ponders on the realities of cultural encounters through the concepts of métissage and hybridity. 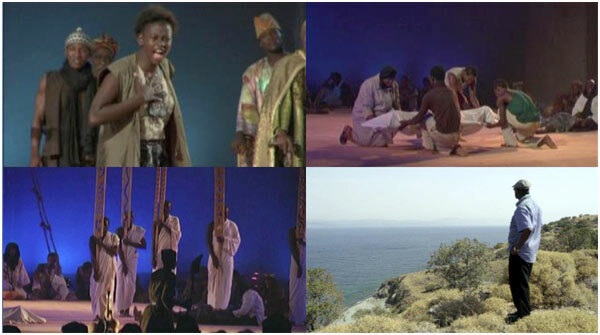 The success and limits of fusing African and European perspectives are tested by interlacing performances from the Bintou Were opera, past and present archival footage of migrations, classic European arias, and interviews with European and African intellectuals, artists and social activists – including Alexander Kluge, Fatou Diome, Nicole Lapierre and Richard Sennett.